Discussions Magazine Music Blog: SPAZ reviews the Collector's Edition of LIMAHL's debut solo album! SPAZ reviews the Collector's Edition of LIMAHL's debut solo album! Limahl is best known as the vocalist for ‘80s Teen Pop stars Kajagoogoo. While many bands take years to fall apart in the wake of their success, Kajagoogoo wasted no time a controversial line-up change. The band was still on their ascension with a few hit singles and an album in the charts when they ejected Limahl, taking their fans by complete surprise. Thankfully, both camps managed to temporarily recover after the dust had cleared. Kajagoogoo’s bassist Nick Beggs took over lead vocals and they released the album Islands not too long after the singer’s departure. 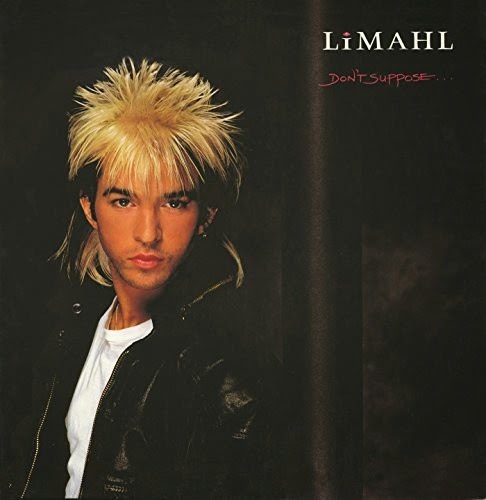 Meanwhile, Limahl aligned himself with producers De Harris (Fashion) and Tim Palmer and recorded this debut solo album Don’t Suppose, released in 1984. What people don’t remember about Kajagoogoo is that they may have been marketed as Pop fluff, the musicians involved were far more accomplished than they were given credit for. Rumors speculated that Limahl was ousted because he wanted to take the band in a more commercial Pop direction and judging by this debut solo platter, that only seemed to be a half-truth. Yes, the album is slick and polished, but it isn’t the blatant display of aural Cheese Whiz that people were expecting. The album’s original tracks, all penned by Limahl, occupy a place somewhere between commercial Pop and thoughtful - though not pretentious - songcraft. However, Limahl had still not come into his own as a songwriter so the hooks take a few spins before they stick in your head - a fact that was more than likely lost on his teenage fans who cared more about his (horrific) hairstyle than they did his music. In 1984, the charts were filled with lighweight Pop songs and those that listened to the radio didn’t have time to let the hooks for the singles “Only For Love” and “Too Much Trouble” sink in. No fault to Limahl, but it was a shame that his more mature material didn't connect as well as it should have. I'm sure there was a lesson learned in their somewhere. The album didn’t initially set the charts on fire, but then along came “Never Ending Story,” the theme song that Giorgio Moroder and Keith Forsey wrote for the movie of the same name. The song WAS a massive hit single and the Don’t Suppose album was repressed with “Never Ending Story” replacing the less-than-stellar album track “The Greenhouse Effect.” For a short while, Limahl was back on top with a hit single and album, which must have been a private victory for the singer when Kajagoogoo’s post-Limahl releases didn’t fare as well. There was DEFINITELY a lesson learned there and Limahl and Moroder would end up working together again. This deluxe two CD edition includes the full album (with “Never Ending Story”) as well as three bonus tracks including the track cut from the original issue. The second disc contains various remixes of the singles, a few non-album tracks and three impressive unreleased demos. Don’t Suppose didn’t break any new ground, but it proved that Limahl was a fighter and he still had his eye on the prize. Certainly worth your time to pick this one up if you are a fan of Kajagoogoo, Limahl and early to mid ‘80s Pop/New Wave.